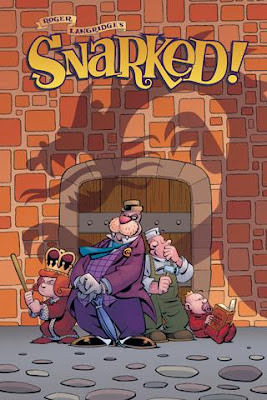 Kleefeld on Comics: Go Buy Snarked! I've been eagerly anticipating the first trade paperback collection of Roger Langridge's Snarked! for some time. I just managed to pick up and read a copy this weekend, and Holy Cow! This is a fantastic book! It's too late and I'm too tired to do a full-on, proper review, but this far exceeded my expectations. I mean, sure, I know Langridge is a talented and funny storyteller, and that's evident in Snarked! But what really wowed me was how A) he kept to many of the same themes, ideas and characters from Lewis Carroll's works WITHOUT doing almost any rehashing, B) it was funny and easily approachable on its own terms if you weren't at all familiar with Carroll's originals, and C) it was made funnier still by loads of small in-references to Carroll's fans. I was actually so taken with it that, when I got to the "to be continued" at the end, I was quite excited because that meant there's more! I hadn't heard any news about the book recently and had assumed it concluded, since Langridge had started work on Popeye. Boy, am I glad to have been wrong about that! Go buy Snarked! This book is brilliant!